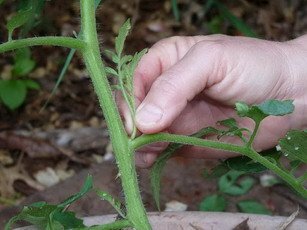 Pruning tomato plants can maximize the number, size, and flavor of your tomatoes. Warm up your pinching fingers and your garden clippers … and find out how a little trim can mean bigger, tastier fruit. Tomatoes are energy factories fueled by sunlight. During their first several weeks in the garden, before blossoms emerge, tomato plants put their energy into growing new leaves. Soon, extra branches emerge to hold more leaves. A side stem grows directly off the main stem. 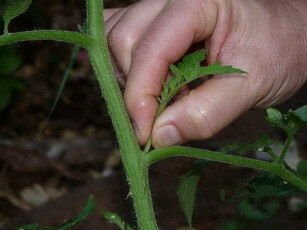 Suckers are new branches that grow out of the tomato’s main stem, just above a leaf branch or side stem (in the “crotch”). As tomato plants get bigger, their leaves produce even more energy. That’s why they continue to put out stems and suckers throughout the season. Suckers that emerge in mid- to late season are nearly always weak, produce inferior fruit, and drain away energy from the main stem. Also, suckers near the bottom of the plant are stronger than those near the top because the plant’s sugar concentration decreases up the height of the plant. Why pinch off or prune suckers? 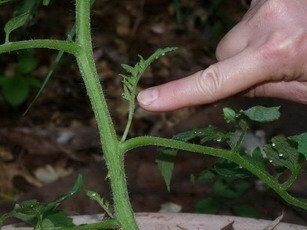 There are several good reasons pruning tomato suckers can help your plants. Earlier production. If you let a sucker grow, it will become a full-blown stem and develop its own blossoms. Extra stems divert energy from the main plant’s fruit production. When you prune suckers, plants invest less energy in producing extra branches and leaves and more energy in fruit, producing an earlier crop. Larger, healthier fruit. Overgrowth means leaves get less sunlight. Un-pruned, unstaked tomato plants get weighed down. When you prune suckers, more leaves are exposed to sunlight and can make energy for the plant. Plants direct energy to existing branches and blossoms, producing larger fruit. Disease prevention. If unsupported, un-pruned tomato plants spread into a horizontal position on the ground. Water splashes up on leaves, spreading fungi and bacteria. Plants become more susceptible to diseases like leaf spot and tomato rot. When you prune suckers, leaves stay drier and diseases don’t spread as easily. Use your fingers to pinch young suckers rather than clippers or a knife. Pinched wounds will heal quickly and are less disease-prone on young plants. When stems become older and tougher you may need to use garden clippers rather than fingers on older plants. Disinfect your tool to prevent an infection to the tomato plant. To grow the strongest tomato plant possible, prune side stems below the first fruit cluster. As a tomato plant matures, its lower leaves begin to yellow. Pinch or prune yellowed leaves to prevent disease, improve the tomato plant’s appearance, and help the plant keep its energy focused on fruit production. Don’t overprune in hot climates. If you grow tomatoes in an area that is hot, be careful not to overprune. Too much sunlight or steady, intense sunlight can lead tomatoes to develop sunscald. Go easy on pruning determinate varieties. Determinate tomatoes set the bulk of their crop at one time. Each plant will produce a limited number of fruit before ceasing production. Avoid pruning tomato determinate varieties or pinch back only suckers that appear below the first flower cluster, or you will reduce your yield. Indeterminates, on the other hand, will continue to grow and set fruit until frost. 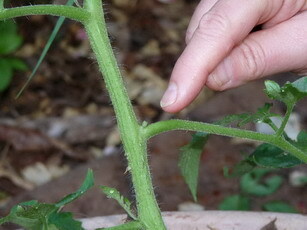 Pruning tomato suckers on indeterminates helps produce healthier, tastier, more abundant fruit. Pruning tomato plants isn’t required. You may choose not to prune your tomatoes and still have an acceptable crop. Tomatoes require only sun, water, and nutrients to grow. Pruning enhances production – more tomatoes, bigger tomatoes, and more flavorful tomatoes.